"Fox returns to his roots in a blistering 3-D space shooter! Take control! 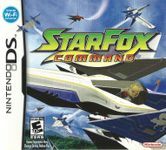 Plot strategic flight paths on the Touch Screen as you soar through a story that features a gripping plot, nine different endings, and popular characters like Falco Lombardi and Krystal!"